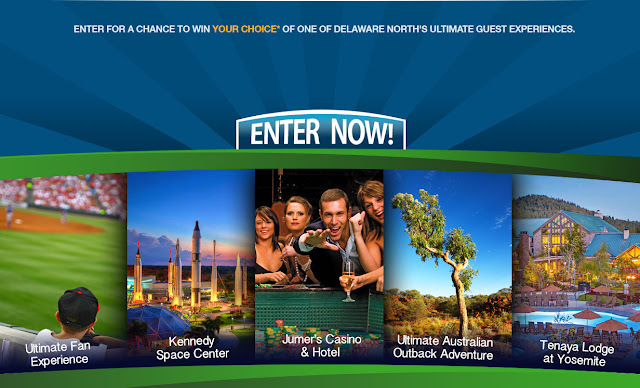 The Delaware North Companies want your opinions and just for taking their survey, you'll be entered to win one of five of their tremendous vacation packages! Grand Prize (1): Winner’s choice of one of the following five (5) destinations: (1) A 4-day/3-night trip for four (4) to Kennedy Space Center in Cape Canaveral, Florida, USA, including round-trip coach class air transportation from major airport nearest winner’s residence, mid-scale Sponsor-specified hotel accommodations for three (3) nights (based on quad occupancy), four (4) annual passes to Kennedy Space Center and US$750 spending money, for the winner only, awarded in the form of a check. (2) A 4-day/3-night trip for two (2) to Tenaya Lodge at Yosemite National Park, USA, including round-trip coach class air transportation from major airport nearest winner’s residence, deluxe accommodations at Tenaya Lodge for three (3) nights (based on double occupancy) and US$750 spending money, for the winner only, awarded in the form of a check. (3) A 4-day/3-night trip for two (2) to Jumers Casino & Hotel in Rock Island, Illinois, USA, including round-trip coach class air transportation from major airport nearest winner’s residence to Moline, IL, deluxe accommodations at Jumer’s Casino & Hotel for three (3) nights (based on double occupancy), airport transfer to and from airport/hotel and US$750 spending money, for the winner only, awarded in the form of a check. (4) A 4-day/3-night trip for two (2) to a location in the winner’s continent where there is a Delaware North Companies Sporting Venue mutually agreed upon by the winner and Sponsor (http://www.delawarenorth.com/Sportservice-Partners.aspx), including round-trip coach class air transportation from major airport nearest winner’s residence, mid-scale Sponsor-specified hotel accommodations for three (3) nights (based on double occupancy), two (2) tickets to a regular season sporting event of winner’s choice (based on availability) and US$750 spending money, for the winner only, awarded in the form of a check. (5) A 5-day/4-night trip for two (2) to the Australian Outback, including round-trip coach class air transportation from the major airport nearest the winner’s residence, hotel accommodations at winner’s choice of a Deluxe Spa Room at the Kings Canyon Resort or The Station Standard Room at El Questro (based on double occupancy and availability), and US$1,700 spending money which must be used toward car rental to access the location of this trip. The maximum ERV of any trip is US$7,000 depending on winner’s state/province/country of departure. This Sweepstakes ends on 08/31/17 and you can ENTER MONTHLY to win.